The Light created a desire to receive and after that divided it into five phases. The “root” phase – Keter still belongs to the Light. And from it the first phase emerges that belongs to the desire, to the Kli, to Hochma. The Hochma phase is a desire to receive that wants to be bestow like Keter and becomes Bina. Bina produces Zeir Anpin, a unique Kli that integrates reception and bestowal within itself. And Zeir Anpin produces Malchut that includes all of the characteristics within itself and wants to get everything without taking account of anything; the main thing is to be filled. These states are called the Four Phases of Direct Light because they are created by the Light that extends directly from above to below. 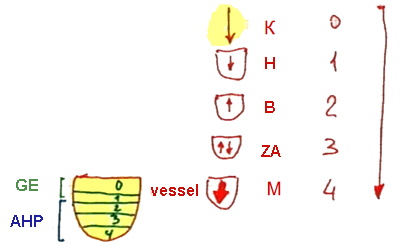 The last phase, Malchut, which is the only true Kli, the creature, is also divided into five parts: 0, 1, 2, 3, 4. Desires on levels 2, 3 and 4 are very strong, difficult, and especially egoistic. They are called receptive desires, the AHP. The desires on levels 0 and 1 are lighter desires, Galgalta ve Eynaim (GE). The goal of creation is to bring all of Malchut to the state of Keter, like the Creator. For this to happen, many actions take place, including a shattering. And now it is up to us to correct everything. It is interesting that there are parts of Malchut that are not ready to be awakened to correction by themselves and require external awakening. And there are parts that awaken by themselves and yearn for the goal of creation, for the Creator. They already want to attain the heavens and the upper world here in this life. Such people come to study the wisdom of Kabbalah; they want to know the meaning of life: What are we living for? Many ask this question, especially in their childhood from the ages of 5 to 10. But after that a child grows and stops asking about this. The moment that sexual attraction develops in him, he forgets these questions about the meaning of life. What can be done about it? That’s life. Society suppresses them in a person and he stops thinking about the meaning of his existence. Among some of the people there are spiritual Reshimot (remembrances) that force them to search for the meaning of life. And other people are not ready even to imagine questions like these. But all of us are parts of the same Kli, everyone must reach correction. The uniqueness of the integral Kli is that each part includes all the rest of the parts within itself. It is impossible to correct the source phase or the first phase without including all the rest of the phases within them. This is the law of the integral system. Even our body functions according to the same principle, even though we are not aware of it. According to eastern medicine there are points on the hands and the feet which represent all the organs of the body: the kidneys, the heart, all of the organs. And this is truly so. So to correct ourselves, we must be drawn towards correction of the whole world. There is no choice! In our day this is an obligation! In previous periods Kabbalists would correct themselves since there was no possibility of speaking openly with people about the wisdom of Kabbalah and about the meaning of life. So Kabbalists were in concealment. It was even forbidden to open one’s mouth to speak about Kabbalah publicly. This situation continued until 30-40 years ago. It was forbidden to talk about the wisdom of Kabbalah in the street, as someone was liable to hear. If someone found out that you were studying Kabbalah, people would simply shy away from you. It was considered to be criminal. And bookstores didn’t sell books about Kabbalah. So throughout the generations, beginning from ancient Babylon, Kabbalists corrected what was possible, meaning themselves. Even thirty years ago they secretly learned the wisdom of Kabbalah. And only in our times has Kabbalah emerged from hiding and become common knowledge. But along with this, we must correct the world; otherwise, we cannot correct ourselves. It was enough for Kabbalists of the past to correct themselves, but for us this is no longer enough. Many sources have been written about this. Baal HaSulam writes in the article, “The Arvut (Mutual Guarantee)”: But the end of the correction of the world will only be by bringing all the people in the world under His work, as it is written,”And the Lord shall be King over all the earth (meaning over every desire); in that day shall the Lord be One, and His name one” (Zechariah, 14:9).